Cast: Andy Samberg, Cheryl Hines, Jeff Daniels, Patrick Warburton. Directed by Kirk De Micco. UK certificate U, US certificate G.
Space Chimps was never going to be a huge crowd-pleaser - the trailer set the expectation bar pretty low. No surprises then, that it's no more than a mild-mannered fantasy jaunt for kids, with everything set at "lite". Nothing is top notch - the animation, the voice-overs, the story, the laughs - but it's just about sufficient for littl'uns bored at home over the rather damp 2008 summer. To enjoy this film: think young. 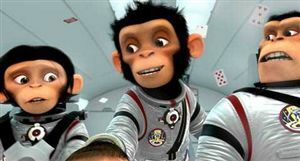 Space Chimps was released in the UK on 1st August 2008.